When Ghaffar Pourazar first encountered Peking Opera in London in 1993, it made such an impact that the 32-year-old British man decided to drop his career as a computer animator to begin his journey of mastering the art form and taking it to new audiences. 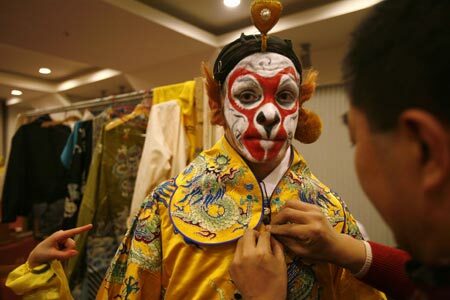 File photo: Ghaffar Pourazar of Britain gets dressed before performing in an English version of the traditional Chinese opera Monkey King at a theatre in Shanghai December 8, 2006. Pourazar is the first foreigner to complete the rigorous training at the Beijing Opera School and the National Academy. "It struck me that I had never seen such a great performance in any other culture or country -- the performance was as good as god," Pourazar said during the 6th Peking Opera Festival, which was held through November 2 to 18 in Wuhan, Hubei Province. For Pourazar, the 200-year-old Chinese traditional art form that blends dancing, singing and martial arts is a time capsule of Chinese culture, history, mythology, poetry and fine arts. After four years of rigorous training at a Beijing opera school with other students -- some decades younger than him -- Pourazar became the first Westerner to complete the program. Starting with painful contortions of his legs and waist at dawn, Pourazar tested the limits of his body on a daily basis. "It was difficult at first, both the singing and dancing, but I found an endless charm that had yet to be explored," he said. After finishing the program, he entered the National Academy of Chinese Theater Arts for a postgraduate program on the role of the Monkey King, a Peking Opera figure based on a popular and beloved Chinese story about a mischievous stone-born monkey who learns supernatural skills in order to challenge the Emperor of Heaven. In 1996, Pourazar won the Golden Dragon Award at an international Peking opera contest for amateur performers for his outstanding performance as the Monkey King. Now armed with fluent Mandarin spoken with a Beijing accent, he has been affectionately nicknamed "Big Nose" of the Peking Opera among Chinese Opera veterans. He also set up the International Monkey King Troupe. Comprised of 15 actors and musicians, the troupe aims to introduce the renowned Chinese character to the rest of the world. The troupe performs the Monkey King's adventures in "Journey to the West" as closely as possible to its traditional Peking Opera form, but in a way that can be understood by an English-speaking audience, as English dialogue has been ushered in. "But I prefer singing in Chinese, as the libretto will be less attractive when sung in English," he said. Pourazar believes that Peking Opera extends far beyond a beautiful art form, as it also depicts China's deep-rooted culture. In an effort to help foreigners understand and appreciate Peking Opera, he has also adapted Shakespeare's "A Midsummer Night's Dream" in a Peking Opera style, and it will be performed by the National Troupe of China. "China has its own culture, and so does Britain. Cao Cao, China's famed warlord during the Three Kingdoms period, mirrors Oliver Cromwell in Britain, and Zhuge Liang was a reputedly intellectual figure in China's history, just as Thomas More," Pourazar said. Morimura Chie, a Japanese Peking Opera performer who debuted at the festival, has been fascinated by Peking Opera since 2001 when she saw "Farewell to My Concubine," a film that stars Leslie Cheung and depicts the lives of Peking Opera performers. Chie trained at the National Academy of Chinese Theater Arts where she met Pourazar. She performs and lectures on Peking Opera in Japan in order to promote the traditional Chinese art form in her home country. "You have to find the person who has an understanding of multiple cultures to better convey Peking Opera to the world," Pourazar said.